Brushing Your Dog Like A Pro! Brushing your dog once or twice a week is usually enough to keep tangles and matting to a minimum, but sometimes we don't brush as often as we know we should (we have busy lives) and stubborn matting develops. Learn how to remove mats and tangles, and how to brush your dog's coat like a professional! Brushing Your Dog: How Often? 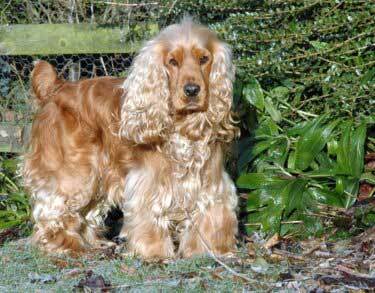 Cocker Spaniel coats are best described as medium to long, with long, fine, silky hairs on the top of the body and a soft short undercoat below. If you want to groom your dog properly, and to a professional standard, you'll need a selection of grooming tools, but don't stint, buy the best you can afford. Not only will quality tools do a better job, they'll last longer too! Most Cocker Spaniels need to be brushed at least every three days to keep them looking good, although if your dog is walked in the countryside you may need to brush him more often. If you're not sure how often you need to brush your Cocker, begin by brushing his coat once every three days. If the brush is picking up lots of loose fur, increase the grooming to every day or every other day. If there's not much hair on the brush you can probably reduce brushing your dog to once or twice a week. 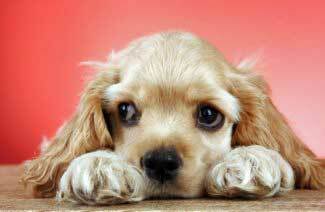 Areas most prone to problems are your dog's 'arm pits', behind his ears, his bottom, leg feathers, and chest. I guess that just about covers your whole Cocker, doesn't it? Sorry, I missed in between his toes. Keep a close eye on this area! I'm getting used to being brushed...I think! 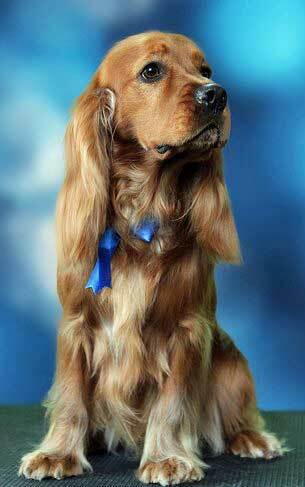 If your dog's coat gets in a tangle, take one area at a time, and using a metal comb, gently tease out the knots. Start from the ends of the hair and slowly work up towards the skin. This should remove most tangles without too much effort. Hold the base of the hair firmly, close to his skin, so that you're not actually pulling his hair or hurting him. I'm sure I don't need to state the obvious but I'm going to anyway. Be very gentle when brushing your dog. Of course, no Cocker owner is going to deliberately hurt their baby, but pulling away at tangled hair won't be much fun for him. If you're gentle and 'coo' to him at the same time he's more likely to stay still for longer and will come to enjoy being brushed. That's the easy bit, (well, if your Cocker will sit still it is) time now for the mats! Not everyone understands what 'matting' is so I'm going to explain here. Matting is a thick, lumpy felt-like material. It's basically fur from his undercoat, which has loosened as part of the natural shedding process. If it's not brushed out regularly, these loose hairs stay in his coat and eventually become 'matted'. Mats are caused by friction and if your dog wears a harness he may be more prone to matting in areas where the harness rubs across his coat, so it's a good idea to check after removing your Cocker's harness. It will only take a couple of seconds and will allow you to deal with them before they develop into 'monster mats'! They're easily missed (especially when they form in awkward places) so it's unlikely that your pet will ever be entirely mat free. Grass, seeds, and burrs can easily become trapped and make 'matters' much worse (if you'll pardon the pun!). Once they're embedded, the sharp edges of grass seeds can often work their way into your dog's skin, causing irritation, pain and infection. If your Cocker Spaniel isn't a 'townie' and is walked in the countryside, I recommend you check his coat for any signs of burrs and plant material as soon as you return home. Brushing your dog's coat regularly will help to keep matting to a minimum but if you should discover one, here's how to deal with it. It's important to remove mats as soon as you discover them otherwise they'll continue to get bigger and create a warm moist area next to your dog's skin. This is an ideal environment for bacteria and yeast, which in turn will lead to irritation, infection and sores. If your dog's coat is heavily matted, tackle as many individual tangles as you can in one 'sitting' and then let him rest for a while - no Cocker is that patient! If you try to comb them all out at once, your Cocker may become anxious or fidgety and he may not be too happy about sitting so still next time around! Just work on one mat at a time, brushing your dog slowly, carefully, and gently. If the mat is not too tight, you may be able to pull it apart with your fingers to loosen the hair and then gently comb it out with a metal comb. If a mat gets wet, it won't help as it can tighten even more as it dries, that's why it's best to remove mats before you bath your dog. You can buy specially formulated de-tanglers (a bit like the conditioners we use on our own hair) which claim to loosen mats. I've yet to find one that really works, but if I do, I'll let you know. If you decide to try a de-tangler, (before brushing your dog) try leaving the product on the mat for a while and then tease it out with a de-matting comb or the prongs of a steel comb. The slicker brush can be used to remove small mats by gently pushing the wires into the mat and moving the brush from side to side in a gentle rocking motion. Repeat this several times and then try brushing it out. Be careful to keep your hand between the mat and your dog's skin so you don't hurt him. If you hold the strip firmly at its base while you're brushing, you won't pull your dog's skin. If it's a really stubborn mat, you could try cutting it into 'strips' with a pair of sharp hair scissors, but be very careful, don't cut too far into the matting, otherwise you may accidentally cut into your Cocker's skin! You can then gently brush each strip with a pin brush or a steel comb. If cutting into the mat doesn't work, as a last resort, you may need to cut it out completely. If you do need to cut out an entire mat, don't cut across it with scissors as it's all too easy to slice open your dog's skin. A cut like this, across his skin, would very probably need stitches. Instead, slide the blade of a pair of scissors down the hair in the direction of growth. Not only will this give the hair a more natural appearance when the mat has been removed, it will be safer for your Cocker too. If you're not too confident about removing a mat with scissors, why not take your dog to a professional groomer and have them cut it out for you? Phew! I didn't realize that brushing your dog could be so dangerous! Cocker Spaniel ears are beautiful, but there is a down side. Their pendulous design often means that they trail across the ground, through all sorts of undesirable 'muck', and no food bowl I've ever found stops them from falling into their dinner! This means that they're often prone to ear infection which can be difficult to get rid of easily and can cause your pet considerable pain and discomfort. 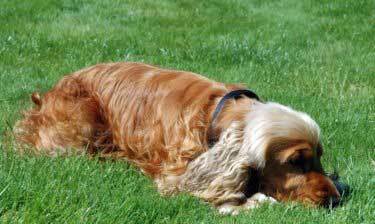 It's essential to keep your Cocker Spaniel's ears clean, healthy and free from infection. When brushing your dog's ears, gently comb out any tangles or matting under and behind the ear before you begin brushing the leathers. This is where you'll find most of the matting on his ears. Cocker's tend to have a lot of fur at the opening of their ears (and just beneath) which can prevent fresh air getting into the ear canal. In turn, this creats a moist area where bacteria can thrive. Following a severe ear infection in my Cocker (which seemed to take an age to diagnose and treat successfully) I now trim away the hair as best I can to help get the air circulating. This link will explain how to remove this hair. For the leathers, I recommend you first use a slicker brush on each side to remove as much loose hair as you can. I find it much easier to brush his ears this way and Max is content to lie there and watch me. Once each ear has been brushed thoroughly on both sides, I use a comb to remove any stubborn undercoat. Always begin from the bottom tip of his ear and slowly work your way up. I'm always surprised at just how much more there is, even after using the slicker brush! Brushing your dog should be fun for you both. Don't rush the job; take your time and be very gentle or he'll come to resent his grooming sessions, especially if you're rough with him. If you stay on top of any mats and tangles it will become easier and more enjoyable for you both. Brushing your dog can be done on the floor or on a table, depending how he behaves and what suits you. Personally, I like to brush Max when he's lying quietly on the rug, either after a long walk (when he's too tired to protest!) or at night time when he's sleepy. My preference would be to brush him on a raised surface because it's easier on the back and I can get the brush into all those nooks and crannies much more easily. However, he's not too keen on being high off the ground and won't stand still for very long! If you're brushing your dog on a raised surface, such as a table, place a rubber mat, or a non-slip bath mat onto the table to prevent your pet from slipping (it will also protect your table!) and never leave him unattended. When working with a pin brush or a comb, begin at the end furthest from your dog's skin and brush small sections at a time in the same direction that the furs grows, gradually working your way up the mat/tat/tangle. While you work, quietly check for fleas or dog ticks - don't wait for the tell-tale signs of scratching and flecking (is that a real word?). Work your way along one side, from head to tail, and then brush the other side, taking care to reach and remove any dead undercoat which will help to stop mats forming in the first place. 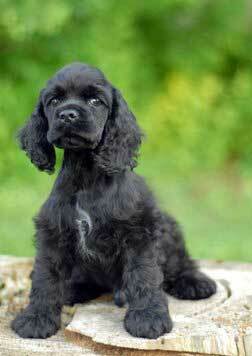 If your Cocker Spaniel behaves, reward him with praise throughout and offer him an occasional treat. Most of all, enjoy it, brushing your dog should be therapeutic, not traumatic! If your Cocker's coat isn't shining it could be a sign of an underlying illness, a sign of worms, or as a result of a poor diet. If you're at all concerned about the condition of your dog's coat take him to see his vet for an accurate diagnosis. Brushing your dog's coat regularly will help to keep his coat looking beautiful and glossy! In fact, it's a good idea to begin brushing when he's very young. He won't need it because he won't yet have any feathers but you will be acclimatizing your Cocker puppy to being brushed and groomed as well as being handled and when it's time for 'big boy brushing' there'll be no surprises!